The Scottish Sub Aqua Club has a training program with three distinct threads: snorkelling; scuba diving and instructing. Most of our new members progress straight into scuba training, and first need to demonstrate competence in the water by completing the simple swimming assessment and basic snorkel assessment. Our Diver Awards consist of a series of practical training sessions and assessments in the pool (or confined open water) followed by similar activities and assessment in the open water (usually the sea). There is also a theory element taught through a series of lectures which form the backbone of this training. 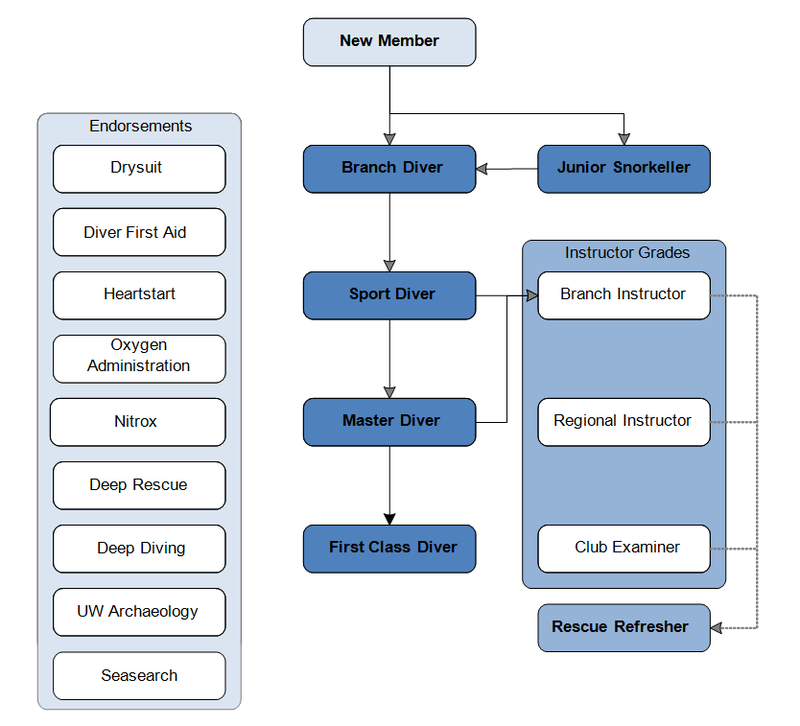 In addition to our core diver training, there are a series of diver endorsements which are typically short stand alone courses, sometimes taught at branch level but often at regional or national level. These include a number of diver welfare courses such as Oxygen Administration, Diver First Aid and HeartStart, and diving skills courses such as Drysuit use, Nitrox, Deep Diving and Deep Rescue. If you've already qualified and hold diving qualifications with another diving agency, you can cross-over to ScotSAC. When you join your Branch Diving Officer will review your previous diving qualifications and experience and advise on any training or assessments required to transfer to ScotSAC. Visit our Crossover page for further information. Our training is specifically designed for diving in Northern UK waters and incorporates rescue and first-aid training, even at Sport Diver level. Learning to dive in a ScotSAC Branch will advance your diving skills within a friendly, safe and sociable environment. What's more, you only have to pay the Branch and ScotSAC membership fees (which includes insurance cover) the cost of training is free! Take a look at our training diagram below for a more detailed idea of how our training progresses.